Known for its mixture of colorful characters and logical, family-oriented storylines, Chikara Pro Wrestling’s been picking up steam in the indie wrestling scene lately. They’ve also been making small breakthroughs this year. In September, they debuted in NYC at the Highline Ballroom. With that, November 13, 2011 will go down as a landmark day, as they presented “High Noon” at The Asylum (former ECW arena) in Philadelphia, and also the company’s first iPPV, airing on GoFightLive. With the main event between Eddie Kingston and Mike Quackenbush to crown their first Grand Champion announced, all eyes were on Chikara to see how they’d deliver with a PPV audience. Young Bucks (w/Marty Jannetty) vs. The Colony (Soldier Ant/Fire Ant): This match was filled with great exchanges, double-teams, and near-falls. This hot opening contest came ended when the Bucks simultaneously missed their high-flying finishers, More Bang For Your Buck (a 450 splash + moonsault), allowing Soldier Ant to get the surprise roll-up for the win. Jakob Hammermeier vs. Sara Del Rey: Having left the BDK (Chikara’s German version of the nWo), the “Queen Of Wrestling” looked to humiliate the BDK’s “voice,” Jakob Hammermeier. She threw him to the floor, pulled his hair, and kicked him while he hung in the ropes. Hammermeier got his licks in with eye rakes and choked her with his tie, but she swiftly defeated him with a double underhook suplex. Tursas vs. Green Ant: Tursas of the BDK took on The Colony’s Green Ant. Using his giant size to his advantage, Tursas dominated Green Ant with vicious moves (one of them a dropkick) before Green Ant battled back with dives from the top turnbuckle to the outside on Tursas and superplexed him. It must’ve affected Tursas as Green Ant won with a variation of a Texas Cloverleaf submission. Archibald Peck (w/Bunny and Veronica) vs. Colt Cabana: Peck was accompanied by a Bunny in a Cabana singlet. A fun match with many in-ring hi-jinks, the Bunny hit Peck with his own marching stick and with the referee distracted, Cabana got the pin and celebrated with the Bunny. Icarus vs. Gregory Iron: Icarus knows how to play a crowd. Even taking off his coat generates the “Worst In The World” big heat. Cerebral Palsy-stricken “Handicapped Hero” Gregory Iron proved to be a nice foil for Icarus as fans were behind him. Icarus escaped Iron’s crossface and threw him at the turnbuckle and pinned him. Post match, Gran Akuma (Icarus’ old Team F.I.S.T. Stablemate) appeared and attempted to kick Icarus, but connected with Iron as Icarus escaped. Akuma walked Iron backstage. Tim Donst/Ares (BDK) vs. Hallowicked/Ultramantis Black: There was a stipulation for all four combatants based on whoever took the pin. Either Hallowicked or Black would unmask, Donst would have his head shaved, or Ares would give up his Eye Of Tear. The incredible action spilled into the crowd, as seating chairs quickly became weapons. After some great near-falls and interference by Crossbones, Donst walked out on Ares, allowing Black to capitalize with his finisher and pin Ares, making Black the new holder of the Eye Of Tear. Mike Quackenbush vs. Eddie Kingston- Chikara Grand Championship: The 12-man tournament “12-Large summit,” named after the late Larry Sweeney, started earlier this year and was down to two. 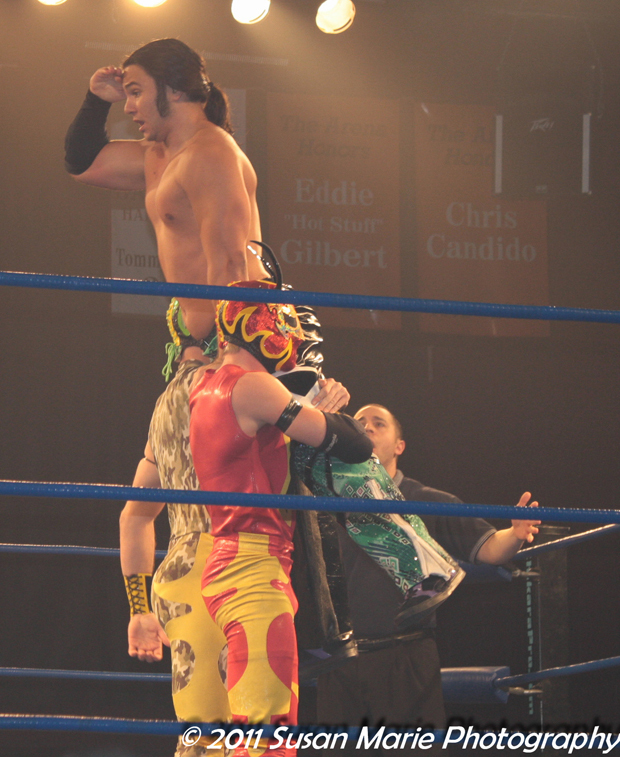 Jigsaw accompanied Quackenbush to the ring while Kingston came out with Tommy Dreamer. Chikara wrestlers knew they were in for a treat and came out to observe the action themselves. It was telling how special this match was when loud chants of “This-is-wrest-ling!” broke out as they exchanged vicious forearm strikes. Eddie released a brutal array of quick punches and kicks on Quackenbush to score the 3-count as the place erupted. The entire Chikara roster cheered on Kingston, as Larry Sweeney’s brother and a friend awarded Kingston the belt. Kingston got on the mic and called out CM Punk, John Cena, Triple H and AJ Styles and proclaimed that as long as he had anything to do with it, no other wrestling product touches Chikara. Final Thoughts: This show mostly lived up to the hype and offered a little of everything: A great tag opener (Young Bucks-Colony), a superb tag brawl (Ares-Donst/UltraMantis Black-Hallowicked), an entertaining comedy match (Cabana/Peck), an intriguing bout between a male and a female (Del Rey-Hammermeier), and even a well-done heel turn by Ophidian on his Osirian Portal teammate, Amasis. True, the show didn’t deliver on all fronts and matches like Tursas-Green Ant and Icarus-Iron could’ve been better, but it was the Young Bucks-Colony, Ares-Donst/Ultra Mantis Black-Hallowicked, and Kingston-Quackenbush matches that made “High Noon” special.